In recent years there has been increasing public awareness of the events in Darwin and northern Australia during the war years of 1942-1945. Indeed, in 2011 the bombing of Darwin on 19th February 1942 was permanently recognised in the 19th February being made a National Day of Observance. 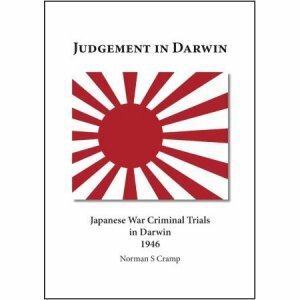 However, in this book author Norm Cramp argues that the important Japanese War Criminal Trials held in Darwin in 1946 are now largely forgotten. Following the surrender of Japan in 1945, many Japanese were convicted of war crimes and faced trials in several different locations. These trials were often controversial - especially at a time when emancipated POWs were returning to their home countries with tales of their wartime suffering. The only Japanese war criminal trials to be held in Australia were three relatively little-known trials held in Darwin in 1946. Specifically, nineteen former Japanese soldiers were tried in Darwin for war crimes perpetrated against Allied troops in Timor. The charges ranged from ill-treatment and torture to that of murdering two Allied soldiers. In this book Norm Cramp details the alleged crimes, the details of the trials and the verdicts. The harshest penalty meted out was death. It is a fascinating story of military courtroom drama and a largely forgotten aspect of Australia's wartime history.